Here's a book that grips you by the throat and kicks you in the teeth. Grozny is the capital city of Chechnya, a semi-independent republic between the Black Sea and the Caspian Sea. Not exactly the place to associate with heavenly beings, just the opposite. During the last decade of the twentieth century the country was torn apart by two bloody wars with Russia. Even in the officially peaceful times Chechnya has less-than-spotless human rights record. In short - it is a violent place. 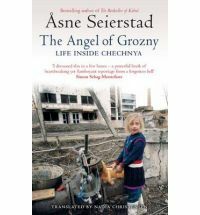 Asne Seierstad has travelled to Chechnya many times, both on 'proper' papers and in secret. She has a particular knack for listening to the stories of common folk and repeating them in a mind-shattering way. The Angel of Grozny hovers somewhere on the border between journalism and activism. Over some 300 pages it shows you a quite clear picture of Chechen-Russian relations, but it presents it through stories of ordinary people from various backgrounds. There's one particular thing present in all the accounts - so much suffering! Such an incredible amount of useless, wasteful, unnecessary, unjust suffering that it takes your breath away. I tend to be rather cold hearted, I'm ashamed to say, too quick with cynical judgement and distrust, but Seierstad's book simply knocked me out. I kept reading fragments out loud to my partner because I simply had to share them with someone. A few paragraphs was enough to get me agitated, bursting with a strange mixture of anger, helplessness, compassion and despair. Powerful stories, powerful book. I keep wondering if the stories should be believed. I tend to distrust storytellers - truth, after all, is such a slippery thing and words can so easily warp it. I'm still not sure. I even had an impulse to somehow contact the author and ask her - is this all true? How much colour did you add? Or is it, is it all as it is down there, in this strange country no one seems to care about? Do such things really happen, in today's so-called civilised world? Do they? The problem is - Seierstad's stories sound so believable. All little details seem to fit. Human behaviours are pictured in seemingly authentic way. There is no black and white, but endless shades of grey and it's so... familiar. The book feels true. It might be the author's skill... But what if it isn't? The Angel of Grozny plays on emotions. It is hard, bordering on impossible, to keep cold-headed rational judgement when reading stories of pain, torture, families torn apart, hatred, fanaticism. Some people would say this makes the book less worthwhile. I wonder. I don't treat Seierstad's account as the absolute truth, but neither do I treat the official news as such. There is no objectivity, all stories are tailored to achieve some aims. News are coloured by propaganda and market research, The Angel of Grozny is designed to evoke compassion. I won't use the big word 'truth' lightly. But of the two approaches to war reporting, I far prefer the latter.